massago.ca | Massage Therapy Canada Podcast has arrived. 13 Feb Massage Therapy Canada Podcast has arrived. The much anticipated Massage Therapy Canada Podcast has arrived. On the Table is a newsworthy podcast for all RMTs. Take the time to listen to a comprehensive discussion on recent tension with Greenshield Canada. The relationship between massage therapists and insurance companies can be a tenuous one. Without provincial health funding, clients of RMTs rely heavily on employee health benefit plans (EHBPs) to finance their massage therapy care. Worker’s compensation and auto-insurance are reportedly tough to work with, and increasingly insurers attempt to position themselves as guardians of health care funding. With adversity rising in relations with some insurers, practitioners worry for this source of funding while insurers are critical on whether utilization of massage therapy provides real value for dollars spent. 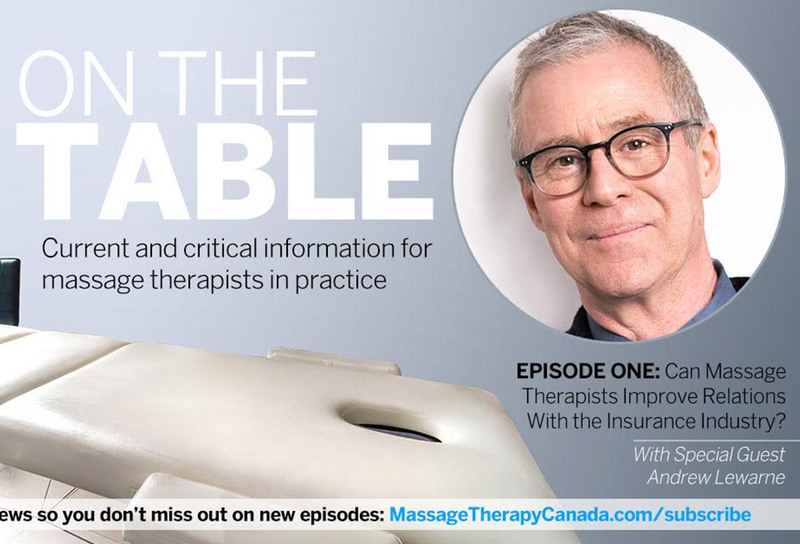 In this edition of On The Table, Don Dillon speaks with RMTAO Executive Director Andrew Lewarne on his conversations with GreenShield, the concerns insurance companies are expressing, and what the massage therapy profession can do to improve insurer relations.